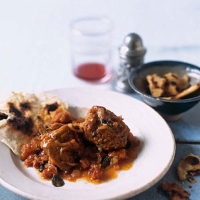 In Extremadura, this fragrant, garlicky, paprika-spiked stew is traditionally eaten with unleavened flatbreads – tortos – much like the Middle Eastern pitta, to scoop up the meat and rich juices. Cut the larger rabbit leg joints in half (use a sharp knife and tap right through the bones with a hammer) and dust all the rabbit pieces through the flour with salt and pepper. Heat half the oil in a roomy casserole and fry the rabbit pieces in 2 batches, till golden; each batch will take about 5 minutes. Remove and reserve. Add all but 1 tbsp of the remaining oil to the pot and fry the garlic and onion gently until they take a little colour. Add the ham, herbs, coriander seeds and tomatoes. Bubble up for 10 minutes or so, till the tomato softens and melts. Return the rabbit pieces to the pan, add about 400ml water to submerge the meat, the meat, bubble up again, season, cover tightly, turn down the heat and simmer for 50 minutes, stirring once or twice, until the meat is nearly falling off the bone. (Alternatively, transfer to the oven at 160C/gas 3 for the same length of time.) Either way, remove the lid and turn up the heat slightly for the last 10 minutes to make sure the juice is well-reduced. When you’re ready to serve, tear one of the breads into small pieces and fry in the reserved spoonful of oil till crisp and golden. Warm the remaining breads; spoon the stew over them and serve with the fried bread bits.